Located halfway between New York City and Boston, and situated at the back of a cluster of houses at 98 Limewood Avenue, Branford, CT, the one bedroom Ennis Cottage is away from street and traffic noise, but within 200 feet of a private beach. 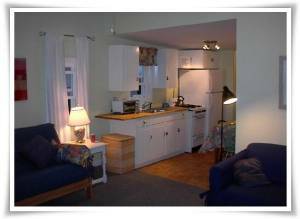 The cottage has been completely remodeled and is tastefully furnished and supervised by the owners. A small park within one mile offers tennis, basketball, and a children's playground. A marketplace, liquor store, laundry, and two restaurants are within walking distance, and a larger mall and churches are with a few miles. The Outlet stores are 1/2 hour away, two casinos are one hour away, IKEA is a 15 minutes and the ferry to Block Island is a one hour drive. The entire house has been renovated. living room has wall-to-wall carpeting, a new full size futon and a love seat, several chairs, bureau, television, VCR, telephone, cathedral ceiling, wireless internet connection, and stove with gas log. The kitchen is new and well equipped with gas stove, microwave and grilling oven, refrigerator, pots and pans, dishes, glasses, and silverware. 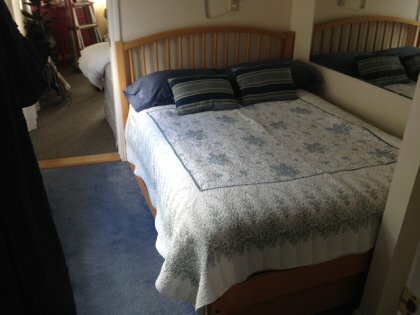 The bedroom has a double bed with drawers beneath, closet, built in air conditioner. Wall-to-wall carpeting. 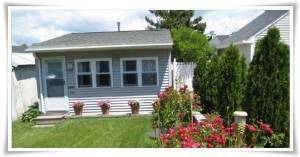 This is a completely remodeled cottage which is quiet, clean and comfortable. Front foor and livingroom with futon. Bed with trundle storage beneath. Beach is directly across the street. Sit anywhere in front of this fence. Ennis Cottage is a sweet retreat with everything you need to make life simple during your stay. Location is private and ideal for beach access, scenic walks, and quick access to the town of Branford. Your hosts extend a welcome that makes you feel right at home. You really hate to leave and begin planning your return on the day of departure! Our stay at the Ennis Cottage was a wonderful experience. The beach was beautiful along with the sunny weather. The cottage was fully equipped with every little necessity. Ron and Bernie were very kind and thoughtful. It was nice of them to drive us to the center of Branford, and pick us up after several hours. We don't have a car, so their help was much appreciated. Also, I fell on my head when crossing the road to the beach. Bernie came over to the cottage bringing first aid supplies to care for my injury. She checked in on me several times during the week, and her concern was genuine and appreciated. Ron and Bernie are trying to sell their house and Ennis Cottage. Unfortunately, this visit to Branford may be our last. Although they want to sell the place, we would like to see Ron and Bernie next summer because they make our stay there so enjoyable. My husband and I needed to unplug. So, we spent the latter part of September at Ennis Cottage â€“ a home-away-from home: comfy, cozy, clean, and well-equipped, cool during the hot spell, and warmed when weather turned cool. The bed, very important for my bad back, was totally comfortable and provided a really restful sleep. The cordial and conscientious owners provided a binder with answers to almost all the questions guests usually ask. Yet they were available to answer queries. A private beach across the street offered a super place to enjoy the fresh air, sunshine, and a great swim. Yet not far away was a wide selection of restaurants, plus great markets for fresh fish, meat and vegetables. Although we did check our e-mail daily, the tv remained untouched. So much to enjoy. The time flew, and it was hard to leave. Our thanks to the friendly and caring owners for doing everything to make us eager to return. My husband and I spent the last two weeks at the Ennis Cottage. We were sad to leave. It was the most relaxing vacation we have had in years. The cottage is immaculate, quaint and so convenient to restaurants, shopping and a beautiful beach. The owners have done a great job to create such a peaceful oasis. We absolutely love the Ennis Cottage and give it a 10 star rating! My husband and I went for a long weekend for our anniversary. The cottage was so cozy and cute, the back yard was perfect for a small BBQ,, very nice landscaping. Great getaway for us, and right across from the beach. We really like that they supplied really nice beach chairs and an umbrella. The beach was great and private. The owners were very accommodating and friendly. Very stress-free booking. We will definitely be returning! Also, Branford has a lot to do! April 17, 2017 Reviewer: Margie O. We had another week of vacation before Labor Day and didn't want to face a day-long drive up or down I-95 from NYC. Luckily, we stumbled upon this listing for Ennis Cottage and it was available! 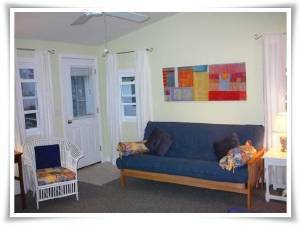 The beautiful cottage is immaculately kept and very comfortable with everything you need -- and just steps from the Long Island Sound. Ron and Bernie were incredibly welcoming to me, my husband, and my 4 year old, ready with beach toys, chairs, towels, and a wagon to help get our vacation started. We spent most of the time on the beach playing in the sand and water. Later in the week, we went to the outlets for school clothes, took a tour of the Thimble Islands, picked berries at a local farm, and went to a local carnival. We loved the lobster at Lenny's, long walks along the water, and exploring the lovely town of Branford. Last January we had set our eyes on the Ennis Cottage for the last two weeks of July and the long wait was worth it. For spending a holiday there is like uncorking your first bottle of wine : once you taste it, you enjoy every moment, you long for more and you begin planning a comeback. The cottage is perfect for couples : intimate, cozy, comfortable with an access to a nice private beach. And how about our hosts ? Ron and Bernie are the kindest and most hospitable people you can hope for as they provide you with every little thing you may need to make your stay a true pleasure. We had hoped for a relaxing time away from home, we ended up living a wonderful experience in a New England gem (Branford, CT), a unique and picturesque place that I strongly recommend to my friends in Quebec. We just got back from spending a lovely week at Ennis Cottage. This was our first beach vacation with our 9 month old daughter and it was the perfect situation. The cottage was very clean and tidy; the kitchen had everything we needed and we loved spending time in our little private backyard with the grill! The beach was very easily accessed and it was lovely to meet all their wonderful neighbors. We enjoyed several of the local restaurants, especially the Tuesday night 2 for 1 lobster dinner at Lenny's Lobster Shack...not to be missed! Overall we had a lovely time and Ron and Bernadette were extremely cordial! Thanks so much! I rented the Ennis cottage for my inlaws this past September and it was a weekend dream come true for them. I used to live in Branford and there is allot to do in the area and great places to eat, the islands to see, etc. The cottage and beach are really better that the photos. The Hekelers are great hosts, it was easy to come and go. It made our (my inlaws and my family) weekend in CT a wonderfully memorable one. We stayed at the Ennis Cottage while visiting our daughter for parents' weekend at Yale. It was perfect for our purpose. 15-20 minute drive to New Haven, fully equipped kitchen allowed for family meals. Very clean and nicely decorated. We have just spent 2 wonderful weeks in the Ennis Cottage from Oct. 4 - Oct. 18, 2008. It was wonderful! The cottage was just what we had dreamed of: comfortable and with all the modern conveniences imaginable. At the same time it was so cozy and warm pleasant, that we felt at home right away. And our hosts were just the kindest and most hospitable people! We could not have wanted a better place to spend a fall fortnight in New England. The weather, the house, the location, the kind owners were just perfect. Our stay at Ennis was lovely! The back yard was very private and beautiful! The beach was clean and great for the kids! Thanks for letting us use your cottage for the week! An extra day would have made our trip perfect. We would like to Thank Ron and his wife for the kindness, hospitality, and attentiveness to our needs during our seemingly so short week at the property. The passion and love they give while designing and maintaining this absolutely amazing piece of property is hard to overestimate. The location is beautiful and convenient. The tranquility of the surrounding ocean shore islands and friendly and hospitable atmosphere in the very neighborhood recharge us for many days ahead. We would like to thank Ron and his wife from the bottom of our harts. 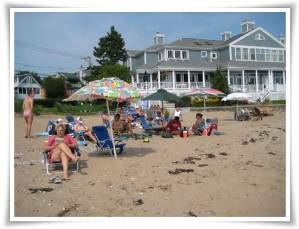 We definitely recommend anyone who appreciate closest shore location (from CT perspective), extremely clean and quiet environmental, and value for their vacation dollars to stay at Ennis cottage. I grew up in Branford and have always stayed with kind friends and family members. 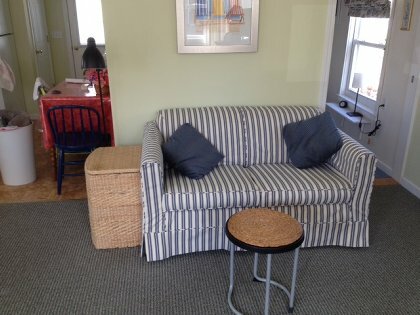 This year I really wanted to rent something near the beach and have some privacy and this cottage is perfect!Cozy, comfortable and our hosts were always helpful. 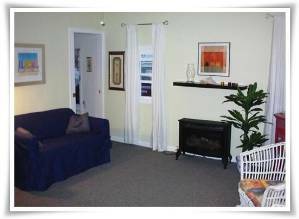 Ennis Cottage is a charming, convenient, comfortable place to saty. We had a great week in Branford, enjoyed the Thimble Islands and several VERY good seafood meals, but mostly we loved the beach and reading in the quiet backyard and the friendly neighbors (including the owners, Ron and Bernie--they are just great.) The cottage is spotless, all new furnishings, fully equipped. We really had a perfect week, and recommend it most enthusiatically. 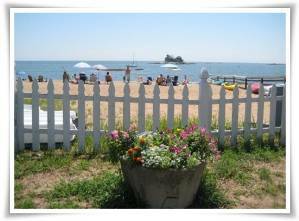 We were guests at your Ennis Cottage on the Branford shore last month. It was one of the nicest vacations we have taken. The bungalow was tastefully furnished, immaculate,and comfortable. The back yard was especially nice and private. Being located right next to the ocean was fantastic. We could be flexible about spending time in the mornings or afternoons in the sun and surf. It was nice to have our choice of eating home in a fully equipped kitchen or choosing one of the many nearby restaurants. We were pleasantly surprised to find so many attractions so close. The ferry to Block Island and the trip to Mystic were at the top of our list. We were amazed at the size of Yale and enjoyed walking around the campus and town. The nearby light houses and little town of Stratton was a real find. Since we enjoyed our leisure time on the beach we did not have time to do everything and therefore we are looking forward to returning next year. My first stay at the newly renovated Ennis cottage. A delightful retreat. It was roomy and comfortable for the two of us and certainly terrific for one. The cottage is beautifully kept and equipped and central to all the things I needed and wanted to do. The owners are friendly and helpful. Our third stay in the Ennis cottage was delightful. Each year it gets better. The new renovations made the cottage stay much more enjoyable. The lighting was great, the new windows work well, and the renovated kitchen and bath were major improvements. The raised ceiling makes the living area appear much larger. We hope to be back again next year. cottage LAST summer. It was GREAT. Ron and Bernie are warm, wonderful hosts..the cottage was perfect for us..
sure. Can't wait to see the renovations. Does the screen door still creak???? Our second stay at the cottage was thoroughly enjoyable. A newly remodeled bedroom and brand new futon in the living area made our stay especially restful. Ron and Bernie are great hosts. We expect to be back next summer. We recently spent a relaxing and enjoyable two weeks at the Ennis Cottage. The location is wonderful with a lovely beach right across the street. Ron and Bernie are friendly and made us feel very much at home. The cottage was clean and well stocked with everything we needed in the kitchen. Though the cottage is small, it was plenty big enough for our family of four. We hope to come back again sometime. Thank you Ron and Bernie!! The Ennis cottage was perfect. Great location, great people, great community. Hopeing to stay 2 weeks next year. My stay at the Ennis Cottage was fantastic. The location is perfect, great for morning walks to the local store or on the beach. The Hekeler's were very accommodating, they made me feel very comfortable. Had a wonderful time. Loved the cottage, the beach, the town. The owners were very accommodating. Hope to be back next year. We had a very enjoyable vacation at this charming cottage. Loved the beautiful beach and scenic views. The owners were very hospitable and made us feel welcome and cared for. We are looking forward to spending another vacation there. This is the perfect cottage! Owners are wonderful. Everything you could possibly want in a vacation retreat! We require a 50% deposit with balance due 30 days before your arrival. A $100 cleaning/security deposit is required. Full refund before 30 days ahead of rental. After that, If we rebook the property we will refund a prorated share of the rental fee for each day we are able to fill less a $25 cancellation fee. A $100 security deposit will be refunded if the place is left clean and without damage.